, a very celebrated English divine, the son of Edward Clarke, esq. alderman of Norwich, and M. P., was born there Oct. 11, 1675. He was instructed in classical learning at the free-school of that town; and in 1691 removed thence to Caius college in Cambridge, where his uncommon abilities soon began to display themselves. 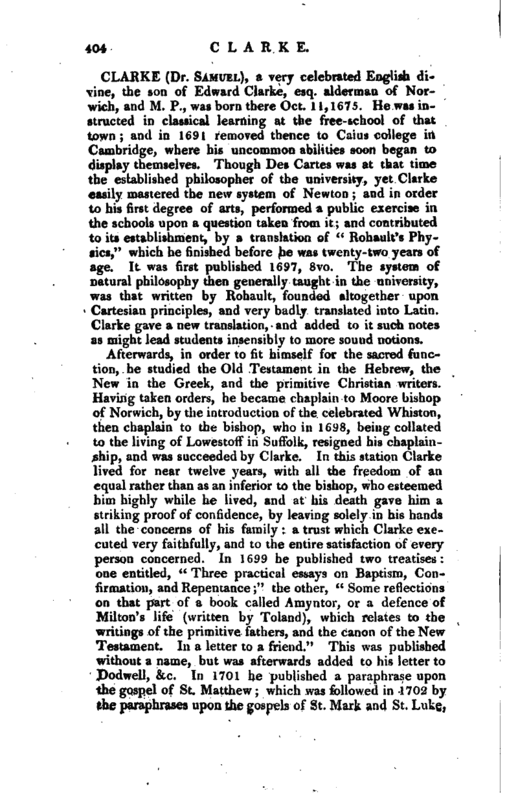 Though Des Cartes was at that time the established philosopher of the university, yet Clarke easily mastered the new system of Newton; and in order to his first degree of arts, performed a public exercise in the schools upon a question taken from it; and contributed to its establishment, by a translation of “Renault’s Physics,” which he finished bafore he was twenty-two years of age. It was first published 1697, 8vo. The system of natural philosophy then generally taught in the university, was that written by Rohault, founded altogether upon Cartesian principles, and very badly translated into Latin. Clarke gave a new translation, and added to it such notes as might lead students insensibly to more sound notions. Afterwards, in order to fit himself for the sacred function, he studied the Old Testament in the Hebrew, the New in the Greek, and the primitive Christian writers. Having taken orders, he became chaplain to Moore bishop of Norwich, by the introduction of the celebrated Whiston, then chaplain to the bishop, who in 1698, being collated to the living of Lowestoff in Suffolk, resigned his chaplainship, and was succeeded by Clarke. In this station Clarke lived for near twelve years, with all the freedom of an equal rather than as an inferior to the bishop, who esteemed him highly while he lived, and at his death gave him a striking proof of confidence, by leaving solely in his hands all the concerns of his family: a trust which Clarke executed very faithfully, and to the entire satisfaction of every person concerned. In 1699 he published two treatises: one entitled, “Three practical essays on Baptism, Confirmation, and Repentance;” the other, “Some reflections on that part of a book called Amyntor, or a defence of Milton’s life (written by Toland), which relates to the writings of the primitive fathers, and the canon of the New Testament. In a letter to a friend.” This was published without a name, but was afterwards added to his letter to Dodwell, &c. In 1701 he published a paraphrase upon the gospel of St. Matthew; which was followed in 1702 by the paraphrases upon the gospels of St. Mark and St, Luke, | and soon after by a third volume upon St. John; afterwards often printed together in 2 vols. 8vo. He had begun a paraphrase upon the Acts of the Apostles, and was to have extended his labours to the remaining books of the New Testament, but something accidentally interrupted the execution, which he himself used to say, was made Jess necessary by the labours of several worthy and learned persons since the appearance of his work upon the four gospels. Meanwhile bishop Moore, his patron, gave him the rectory of Drayton near Norwich, and procured for him a parish in that city; and these he served himself in that season when the bishop resided at Norwich. His preaching was without notes, until he became rector of St. James’s. In 1704 he was appointed to preach BoyieV lecture; and the subject he chose was, “The Befog and Attributes of God.” He succeeded so well in this, and gave such high satisfaction, that he was appointed to preach the same lecture the next year; when he chose for his subject, “The 1 Evidences of natural and revealed Religion.” These sermons were first printed in two distinct volumes: the former in 1705, the latter in 1706. They have since been printed in one volume, and have passed through several editions. In the fourth or fifth were added several letters to Clarke from Butler, afterwards bishop of Durham, relating to the demonstration of the being and attributes, with the doctor’s answers. In the sixth edition was added, a discourse concerning the connection of the prophecies in the Old Testament, and the application of them to Christ: and an answer to a seventh letter concerning the argument a priori. 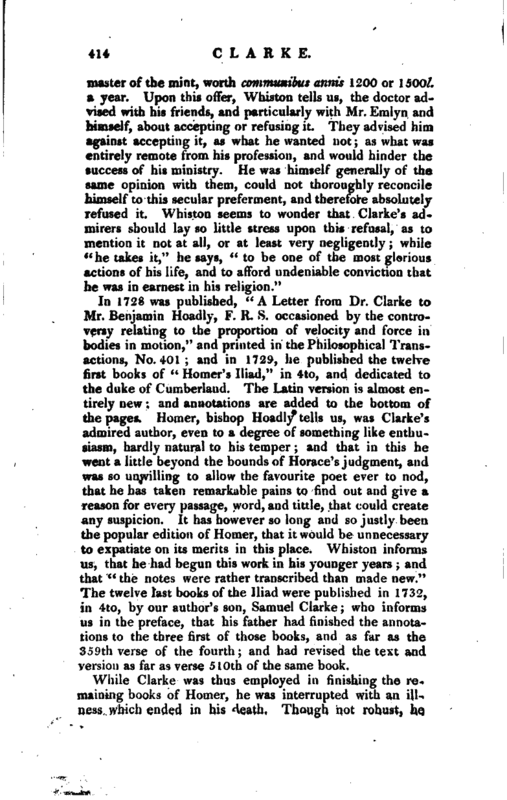 It may not be amiss to observe, that Clarke’s sermons concerning the being and attributes of God occasioned a controversy, but we dp not find that Clarke himself ever appeared in it *. and Attributes of God: in answer to a Eternity, as also the Self-Existence, Postscript, &c. By the author of the necessary Existence, and Unity of the first Defence,“London, 1732, in 8vo. DivineNature, by Edmund Law,M. A.” The same year was published a pam- the other entitled, “An Examination pbk-t, entitled,” Dr. Clarke’s notion of Dr. Clarke’s notion of Space, by Joof Space examined ia vindication of seph Clarke, M. A.“Mr. 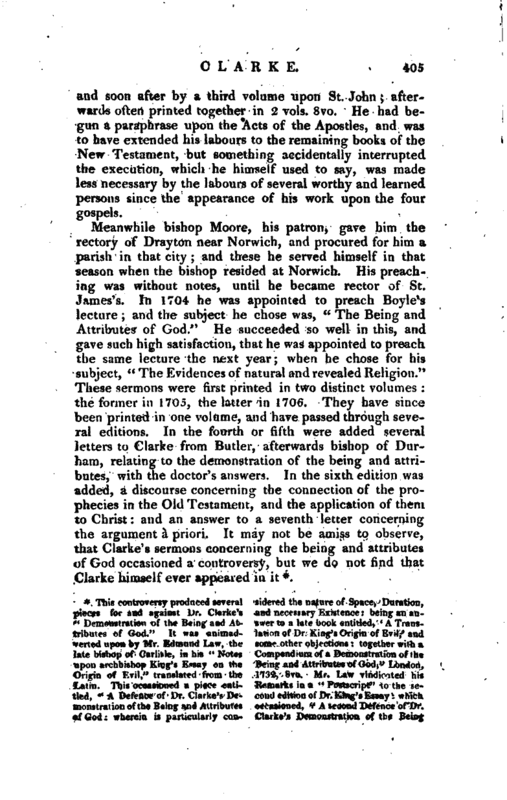 John Clarke; the translation of archbishop King’s author of the two Defences of Dr. ‘ Origin of Evil:V being an answer to Clarke’s Demonstration, having pubtwo late pamphlets entitled, A Defence, lished a third, Mr. Joseph Clarke pub­&c.” Mr. John Jackson published a lished “A farther Examination of Dr. piece, entitled,” The Existence and Clarke’s notions of Space, with some Unity of God, proved from his Nature considerations on the possibility of and Attributes: being a Vindication of Eternal Creation: in reply to Mr. 3)r. Claike’s Demonstration of the John Clarke’s third Defence, &c. To lleing and Attributes of God,“London, which are added, some remarks oa 1734, in 8vo. 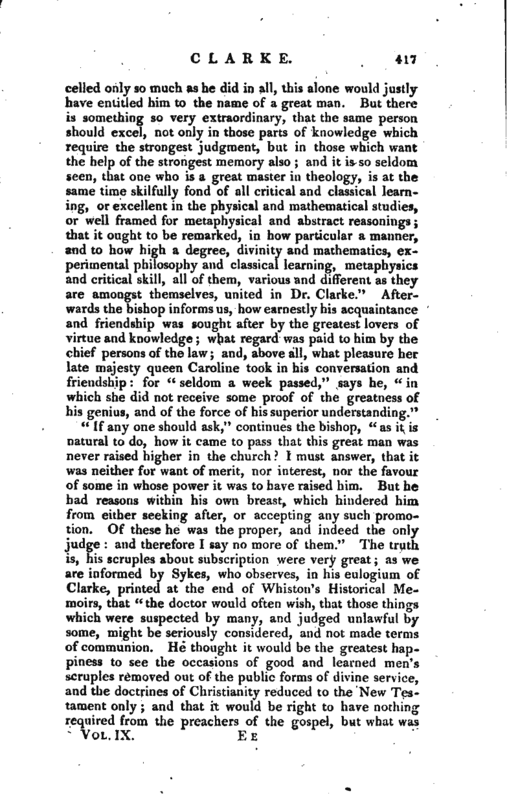 The same year appeared Mr. Jackson’s exceptions to Dr. Clarke’s two pamphlets, printed at Cambridge notions of Space examined in his Exone entitled,” An Enquiry into the v istence and Unity,“&c, ideas x of Space, Time, Immensity, and | remarks on a pretended demonstration of the immateriality and natural immortality of the soul, in Mr. Clarke’s answer to his late epistolary discourse, &c. They were afterwards all printed together; and the answer to Toland’s Amyntor added to them. In the midst of all these labours he found time to shew his regard to mathematical and physical studies, which were not a little improved by the friendship of sir Isaac Newton, at whose request he translated his” Optics" into Latin in 1706. With this version sir Isaac was so highly pleased, that he presented him with the sum of 500l. or 100l. for each child, Clarke having then five children. This same year also, bishop Moore procured for him the rectory of St. Bennet’s, Paul’s Wharf, London; and soon after carried him to court, and recommended him to the favour of queen Anne. She appointed him one of her chaplains in ordinary; and, in consideration of his great merit, and at the request of the bishop, presented him to the rectory of St. James’s Westminster, in 1709. From this time he left off preaching without notes, and wrote his sermons at length, with much care and fit for the press, in which state they were found at his death. Upon his advancement to St. James’s rectory, he took the degree of D. D.; when the public exercise which he performed for it at Cambridge was much admired. The questions which he maintained were these: 1. “Nullum fidei Christiana? dogma, in sacris scripturls traditum, est rectse rationi dissentaneum:” that is, No article of the Christian faith, delivered in the holy scriptures, is discordant to right reason. 2. “Sine action am humanarum libertate nulla potest esse religio:” that is, Without the liberty of hunpan actions there can be no religion. 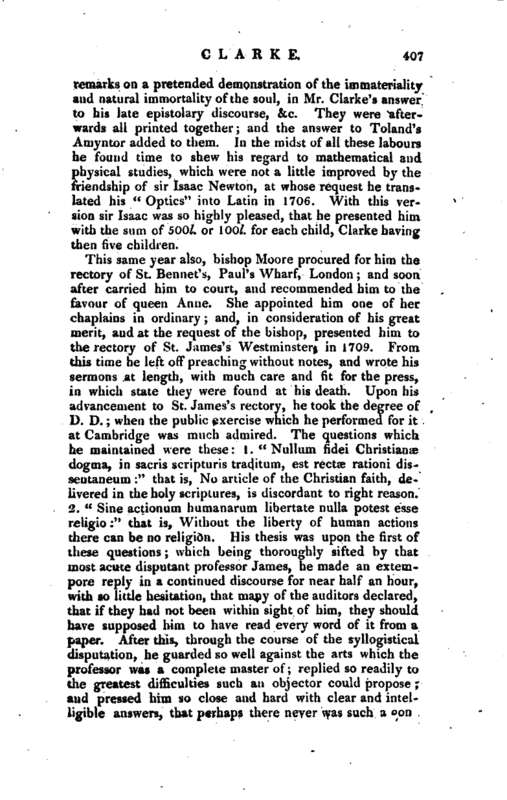 His thesis was upon the first of these questions; which being thoroughly sifted by that most acute disputant professor James, he made an extempore reply in a continued discourse for near half an hour, with so little hesitation, that many of the auditors declared, that if they had not been within sight of him, they should have supposed him to have read every word of it from a paper. After this, through the course of the syllogistical disputation, he guarded so well against the arts which the professor was a complete master of; replied so readily to the greatest difficulties such an objector could propose; and pressed him so close and hard with clear and intel* ligible ausvyers, that perhaps there never was such a | flict heard in those schools. The professor, who was a man of humour as well as learning, said to him at the end of the disputation, “Profecto me probe exereuisti,’ 7 that is,” On my word, you have worked me sufficiently;“and the members of the university expressed their astonishment that a man even of Clarke’s abilities, after an absence of so many years, should acquit himself as if this sort of academical exercise had been his constant employment; and with such fluency and purity of expression, as if he had been accustomed to no other language in conversation but Latin. The same year, 1709, he revised and corrected Whiston’s translation of the” Apostolical Constitutions" into English, at the author’s particular request. In 1712 he published a most beautiful and splendid edition of “Caesar’s Commentaries,” adorned with elegant engravings. It was printed in 1712, fbl. and afterwards in 1720, 8vo. It was dedicated to the great duke of Marlborough, “at a time,” says bishop Hoadly, “when his unequalled victories and successes had raised his glory to the highest pitch abroad, and lessened his interest and favour at home.” In the publication of this book, the doctor took particular care of the punctuation. In the annotations, he selected what appeared the best and most judicious in former editors, with some corrections and emendations of his own interspersed. We shall subjoin a list of those published by our author, referring, for the rest, to a pamphlet entitled “An account of all the considerable books and pamphlets that have been written on either side, in the Controversy concerning the Trinity, since the year 1712. In which is also contained an account of the pamphlets written this last year on each side by the Dissenters, to the end of the year 1719,” London, 1720, 8vo. Dr. Clarke’s tracts are as follow: 1. A Letter to the rev. Dr. Wells, in answer to his Remarks,“London, 1714, 8 vo. 2. ” A Reply to the Objections of Robert Nelson, esq. and of an anonymous author, (supposed to be Dr. James Knight, vicar of St. Sepulchre’s, London) against Dr.Clarke’s Scripture Doctrine of the Trinity: being a commentary on forty select Texts of Scripture.“5. ” An Answer to the Remarks of the author, (Dr. Gastrel, bishop of Chester), of some Considerations concerning the Trinity, and the ways of managing that Controversy,“These two last published together London, 1714, 8vo. 4. ” A Letter to the late rev. Mr. R.M. (Richard Mayo), con taining Observations upon his book entitled A plain Scripture Argument against Dr. Clarke’s Doctrine concerning the ever-blessed Trinity.“5. 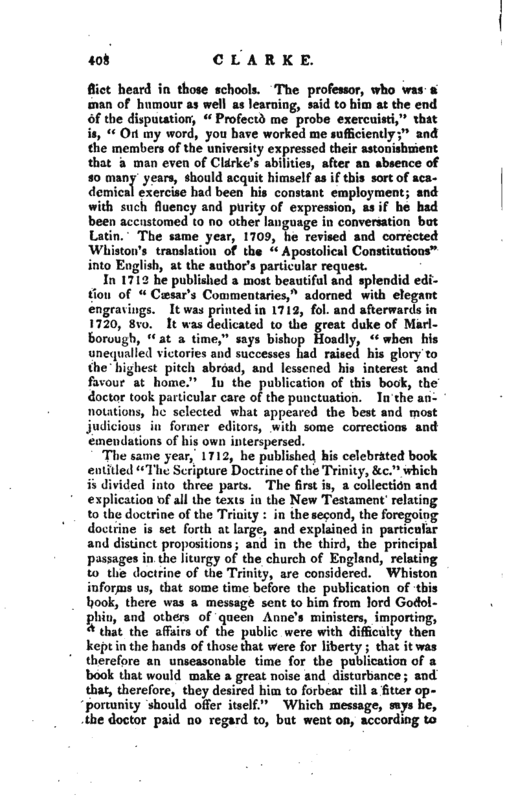 ” A Letter to the author of a book, entitled The true Scripture Doctrine of the most holy and undivided Trinity, continued, and vindicated: Recommended first by Mr. Nelson, and since by Dr. Waterland.“The two last pieces published together, London, 1719, 8vo, at the end of a tract by another author, entitled ”The modest Plea for the Baptismal and Scriptural notion of the Trinity,“&c. 6. ” The modest Plea continued or, a brief and distinct Answer to Dr. Waterland’s queries relating to the Doctrine of the Trinity,“LoncW, 1720, 8vo. 7. 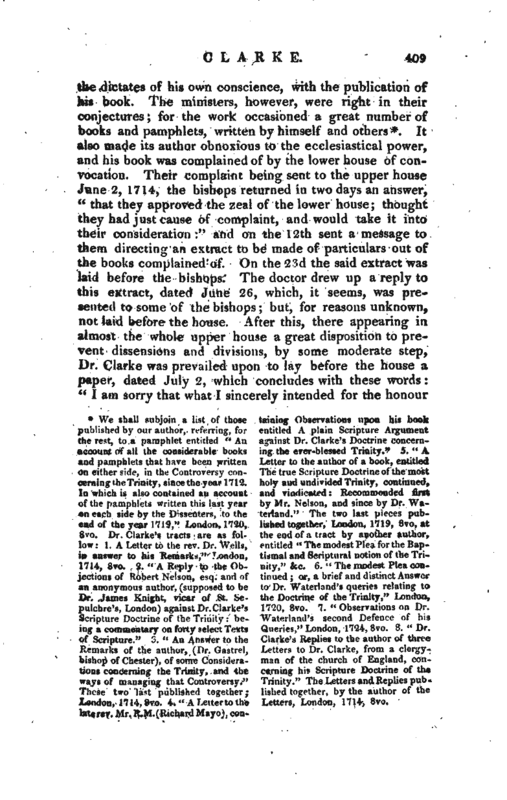 ” Observations on Dr. Wuterland’s second Defence of his Queries,“London, 1724, 8vo. 8. 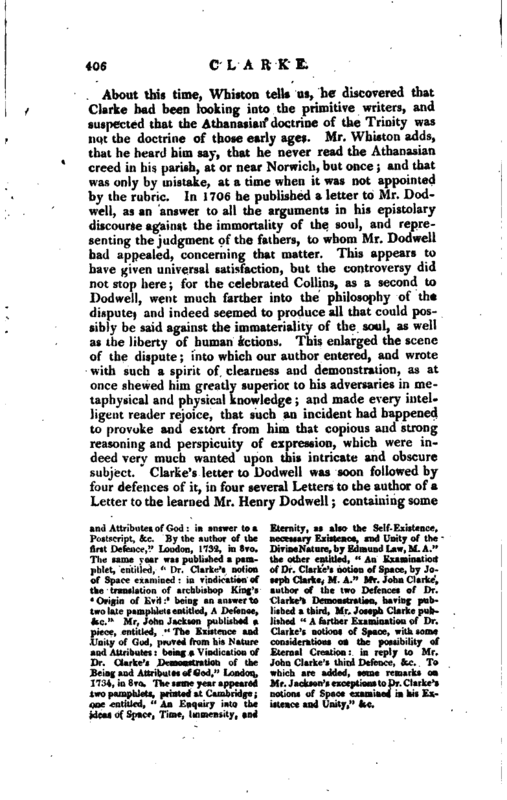 ” Dr. Clarke’s Replies to the author of three Letters to Dr. Clarke, from a clergyman of the church of England, concerning his Scripture Doctrine of the Trinity." The Letters and Replies pub lished together, by the author of the Letters, London, 1714-, 8ro. 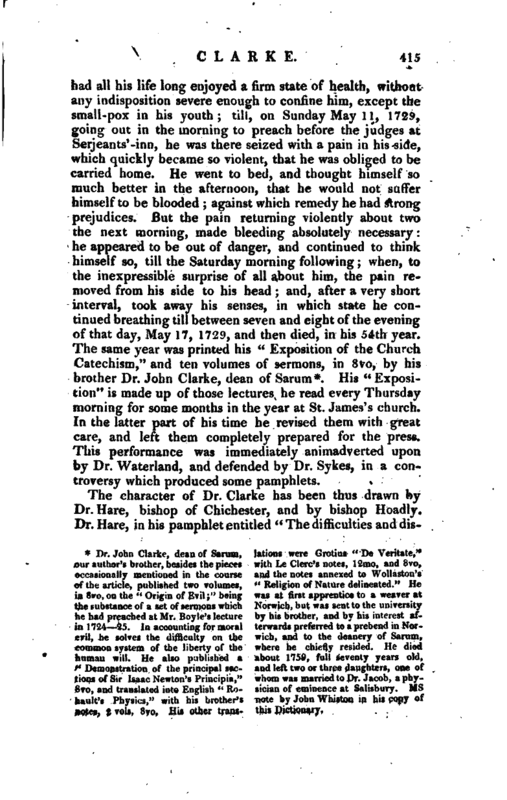 After this paper had been before the upper house, being apprehensive that, if it should be published separately, as afterwards happened, without any true account of the preceding and following circumstances, it might be misunderstood in some particulars, he caused an explanation, dated July 5, to be presented to the bishop of London, the next time the upper house met: setting forth, “That whereas the paper laid before their lordships the Friday before, was, through haste and want of time, not drawn up with sufficient exactness, he thought himself indispensably obliged in conscience to acquaint their lordships, that he did not mean thereby to retract any thing he had written, but to declare that the opinion set forth at large in his Scripture Doctrine, &c. is, that the Son was eternally begotten by the eternal incomprehensible power and will of the Father, &c. and that, by declaring he did not intend to write any more concerning the doctrine of the Trinity, he did not preclude himself from a liberty of making any inoffensive corrections in his former books, if they should come to another edition, or from vindicating himself against any misrepresentations or aspersions, which might possibly hereafter be cast upon him, on occasion of this controversy.” After the delivery of this explanation, the upper house resolved, July 5,. to proceed no farther upon the extract, laid before them by the lower house and ordered Dr. Clarke’s papers to be entered in the acts of that house. 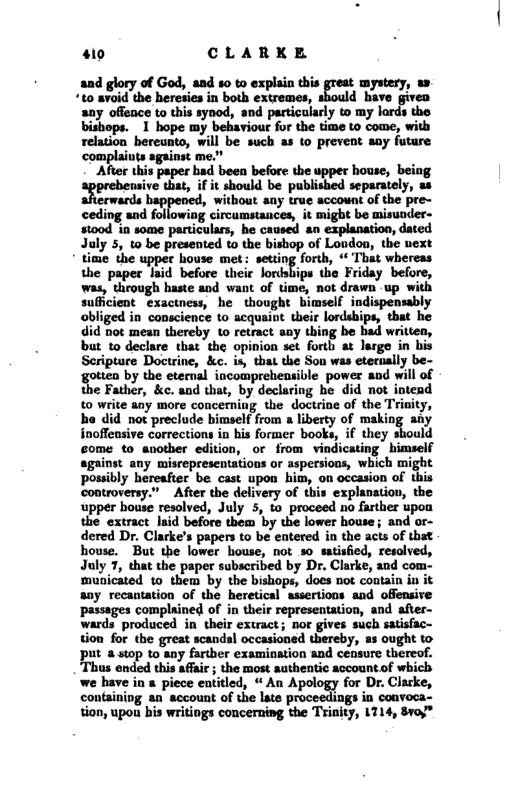 But the lower house, not so satisfied, resolved, July 7, that the paper subscribed by Dr. Clarke, and communicated to them by the bishops, does not contain in it any recantation of the heretical assertions and offensive passages complained of in their representation, and afterwards produced in their extract; nor gives such satisfaction for the great scandal occasioned thereby, as ought to put a stop to any farther examination and censure thereof. Thus ended. 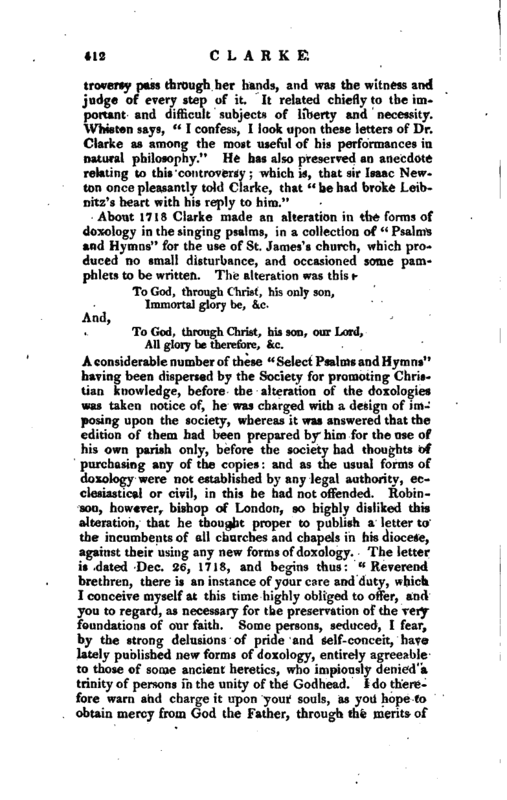 this affair; the most authentic account of which we have in a piece entitled, “An Apology for Dr. Clarke, containing an account of the late proceedings in convocation, upon his writings concerning the Trinity, 1714, 8vo,” | written, Whiston tells us, by a clergyman in the country, a common friend of his and Dr. Clarke’s, with the knowledge and assistance of the latter. The “Scripture Doctrine of the Trinity,” as we have observed, was first published in 1712; afterwards there was a second edition, with many alterations, in 1710; and there has been, since his death, a third edition, with very great additions, left under the doctor’s hand ready prepared for the press. 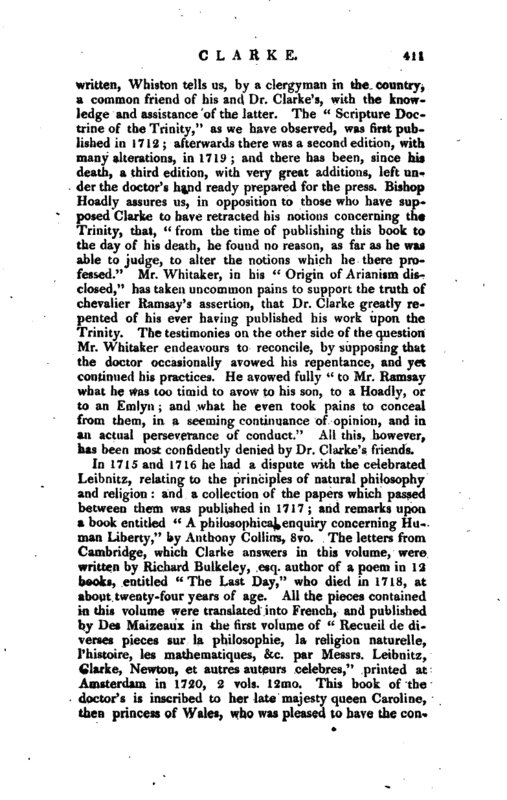 Bishop Hoadly assures us, in opposition to those who have supposed Clarke to have retracted his notions concerning the Trinity, that, “from the time of publishing this book to the day of his death, he found no reason, as far as he was able to judge, to alter the notions which he there professed.” Mr. Whitaker, in his “Origin of Arianism disclosed,” has taken uncommon pains to support the truth of chevalier Ramsay’s assertion, that Dr. Clarke greatly repented of his ever having published his work upon the Trinity. The testimonies on the other side of the question Mr. Whitaker endeavours to reconcile, by supposing that the doctor occasionally avowed his repentance, and yet continued his practices. He avowed fully “to Mr. Ramsay what he was too timid to avow to his son, to a Hoadly, or to an Emlyn; and what he even took pains to conceal from them, in a seeming continuance of opinion, and in an actual perseverance of conduct.” All this, however, has been most confidently denied by Dr. Clarke’s friends. All glory be therefore, &c.
In 1728 was published, “A Letter from Dr. Clarke to Mr. Benjamin Hoadly, F. R. S. occasioned by the controversy relating to the proportion of velocity and force in bodies in motion,” and printed in the Philosophical Transactions, No. 401; and in 1729, he published the twelve first books of “Homer’s Iliad,” in 4to, and dedicated to the duke of Cumberland. The Latin version is almost entirely new; and annotations are added to the bottom of the pages. Homer, bishop Hoadly tells us, was Clarke’s admired author, even to a degree of something like enthusiasm, hardly natural to his temper; and that in this he went a little beyond the bounds of Horace’s judgment, and was so unwilling to allow the favourite poet ever to nod, that he has taken remarkable pains to find out and give a reason for every passage, word, and tittle, that could create any suspicion. It has however so long and so justly been the popular edition of Homer, that it would be unnecessary to expatiate on its merits in this place. Whiston informs us, that he had begun this work in his younger years; and that “the notes were rather transcribed than made new.” The twelve last books of the Iliad were published in 1732, in 4to, by our author’s son, Samuel Clarke; who informs us in the preface, that his father had finished the annotations to the three first of those books, and as far as the 359th verse of the fourth; and had revised the text and version as far as verse 510th of the same book. Dr. John Clarke, dean of Sarum, our author’s brother, besides the pieces occasionally mentioned in the course of the article, published two volumes, in 8vo, on the “Origin of Evil;” being the substance of a set of sermons which he had preached at Mr. Boyle’s lecture in 1724—25. In accounting for moral evil, be solves the difficulty on the common system of the liberty of the human will. He also published a “Demonstration of the principal sections of Sir Isaac Newton’s Principia,” 8vo, and translated into English “Rohauit’s Physics,” with his brother’s notes, 2 vols. 8vo. His other trans­ lations were Grotius “De Veritate,” with Le Clerc’s notes, 12rao, and 8vo, and the notes annexed to Wollaston“”Religion of Nature delineated." He was at first, apprentice to a weaver at Norwich, but was sent to the university by his brother, and by his interest afterwards preferred to a prebend in Norwich, and to the deanery of Sarum, where he chiefly resided. He died about 1759, full seventy years old, and left two or three daughters, one of whom was married to Dr. Jacob, a physician of eminence at Salisbury. ms note by John Whiston in his copy of this Dictionary. His “Exposition” is made up of those lectures he read every Thursday morning for some months in the year at St. James’s church. In the latter part of his time he revised them with great care, and left them completely prepared for the press. This performance was immediately animadverted upon by Dr. Waterland, and defended by Dr. Sykes, in a controversy which produced some pamphlets. Vol. IX, | purely primitive. This he thought to be the only means of making the minds of sincere Christians easy and quiet. 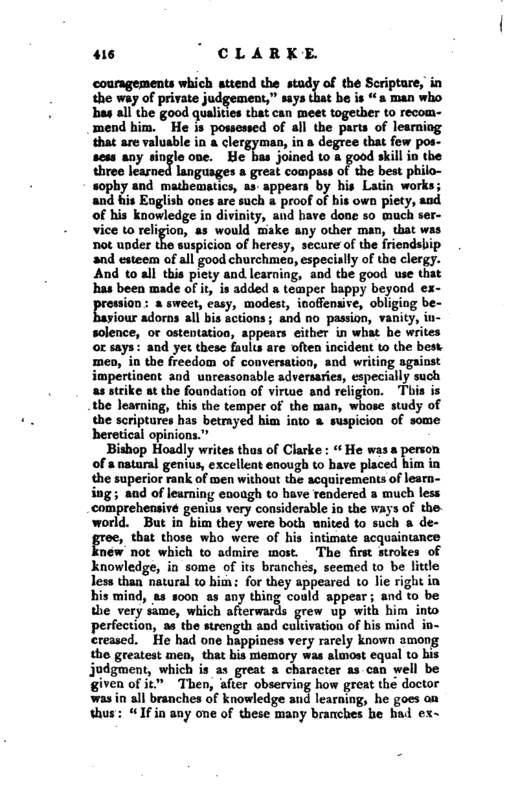 This he believed would make men much more charitable to one another: and make the governors of the church and state transact their important affairs with greater ease and freedom from disturbances.“Upon the whole, bishop Hoadly makes no scruple to declare, that” by Dr. Clarke’s death, the world was deprived of as bright a light, and masterly a teacher of truth and virtue, as ever yet appeared amongst us and,“says he in the conclusion of his account,” as his works must last as long as any language remains to convey them to future times, perhaps I may flatter myself that this faint and imperfect account of him may be transmitted down with them. And I hope it will be thought a pardonable piece of ambition and self-interestedness, if, being fearful lest every thing else should prove too weak to keep the remembrance of myself in being, I lay hold on his fame to prop and support my own. I am sure, as I have little reason to expect that any thing of mine, without such an assistance, can live, I shall think myself greatly recompensed for the want of any other memorial, if my name may go down to posterity thus closely joined with his; and I myself be thought of, and spoke of, in ages to come, under the character of The Friend of Dr. Clarke.“’ On the other hand, Whiston, who wrote his Life, and held him in as high estimation as either Dr. Hare or Dr. Hoadly, candidly mentions those failings, some of which, perhaps, may occur to the reader in perusing the preceding pages, and considerably lessen our opinion of his consistency. In the lirst place, he blames Clarke for subscribing the articles, at a time when he could not, with perfect truth and sincerity, assent to the Athanasian parts of them; namely, at his taking the degree of doctor in divinity. 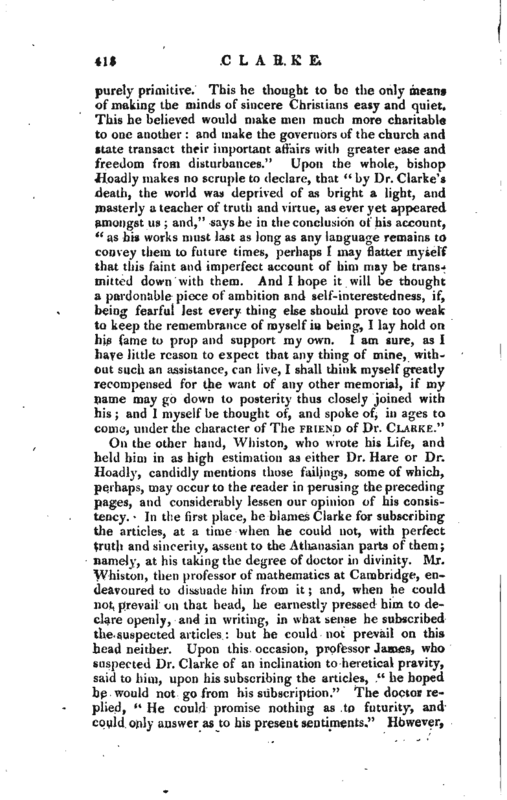 Mr. Whiston, then professor of mathematics at Cambridge, endeavoured to dissuade him from it; and, when he could not prevail on that head, he earnestly pressed him to declare openly, and in writing, in what sense he subscribed the suspected articles: but he could not prevail on this head neither. 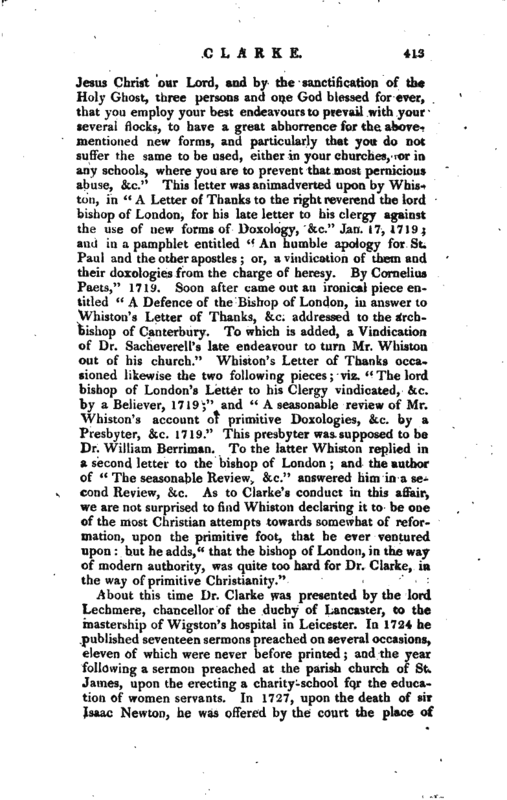 Upon this occasion, professor James, who suspected Dr. Clarke of an inclination to heretical pravity, said to him, upon his subscribing the articles,” he hoped he would not go from his subscription.“The doctor replied,” He could promise nothing as to futurity, and eould only answer as to his present sentiments*“However, | Mr.Whiston acknowledges, that Dr. Clarke, for many years before he died, perpetually refused all, even the greatest preferments, which required subscription, and never encouraged those who consulted him to subscribe. In the next place, he objects to Dr. Clarke his not acting sincerely, boldly, and openly, in the declaration of his true opinions, and his over-cautious and over-timorous way of speaking, writing, and acting, in points of the highest consequence. When Mr. Whiston gave him frequent and vehement admonitions upon this head, his general answer, he tells us, was, who are those that act better than I do” Very few of which,“says he,” I could ever name to him though I did not think that a sufficient excuse.“Lastly, Mr. Whiston is greatly displeased with Dr. Clarke’s conduct in relation to the affair of the convocation, and concludes the account of that affair with these words” Thus ended this unhappy affair unhappy to Dr. Clarke’s own conscience unhappy to his best friends and above all unhappy as to its consequences, in relation to the opinion unbelievers were hereupon willing to entertain of him, as if he had prevaricated all along in his former writings for Christianity." 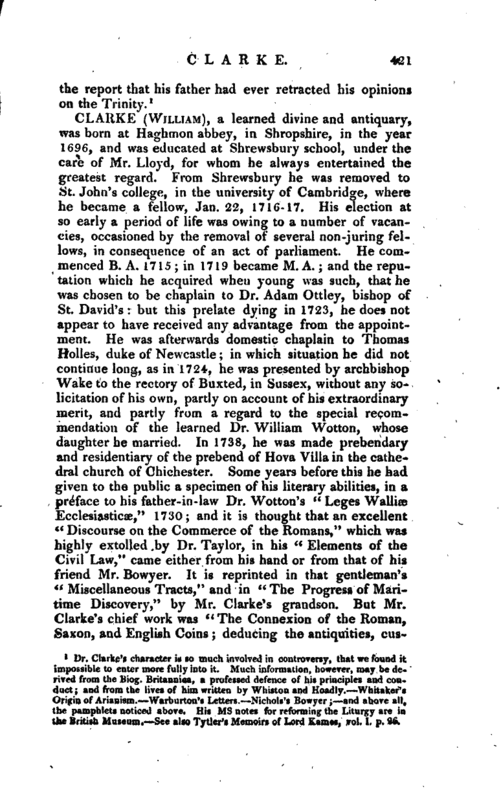 Some anecdotes respecting Dr. Clarke’s personal character, lately collected by the rev. Mr. Jones of Welwyn, are not incurious. 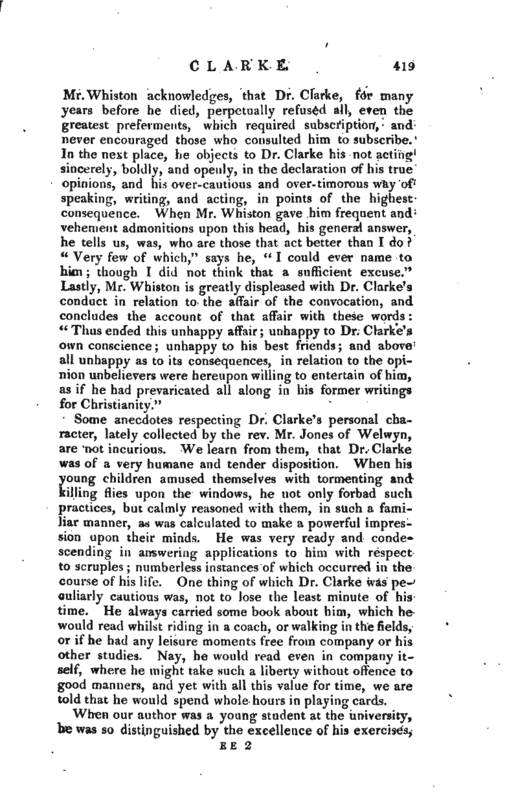 We learn from them, that Dr. Clarke was of a very humane and tender disposition. When his young children amused themselves with tormenting and killing flies upon the windows, he not only forbad such practices, but calmly reasoned with them, in such a familiar manner, as was calculated to make a powerful impression upon their minds. He was very ready and conde* scending in answering applications to him with respect to scruples; numberless instances of which occurred in the course of his life. One thing of which Dr. Clarke was peculiarly cautious was, not to lose the least minute of his time. He always carried some book about him, which he would read whilst riding in a coach, or walking in the fields, or if he had any leisure moments free from company or his other studies. Nay, he would read even in company itself, where he might take such a liberty without offence to good manners, and yet with all this value for time, we are told that he would spend whole hours in playing cards. 2 | and by other marks of unusual proficiency in literature, that he was commonly spoken of, among the rest of the scholars, by the title of “The lad of Cains.” His public exercise, which we have mentioned above, was long remembered in the university, and by the learned men of that period. Dr. Henry Yarborough, prebendary of York, and rector of Tewing, Herts, declared, that he never heard any act equal to it or like it. 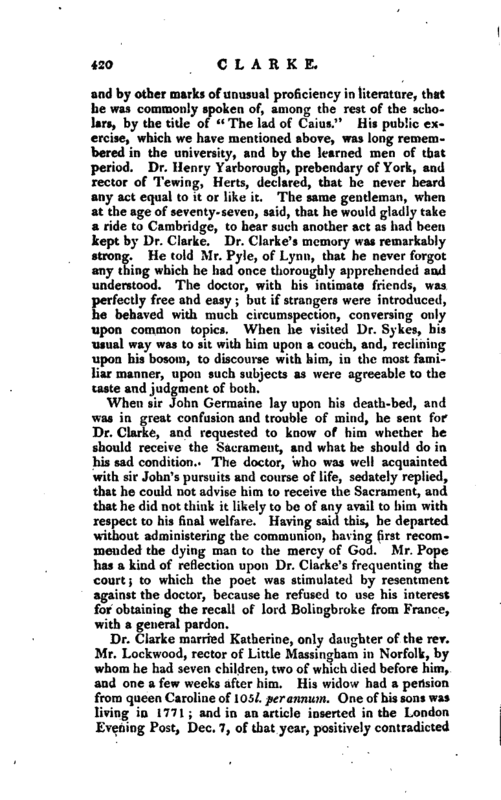 The same gentleman, when at the age of seventy- seven, said, that he would gladly take a ride to Cambridge, to hear such another act as had been kept by Dr. Clarke. Dr. Clarke’s memory was remarkably strong. He told Mr. Pyle, of Lynn, that he never forgot any thing which he had once thoroughly apprehended and understood. The doctor, with his intimate friends, was perfectly free and easy; but if strangers were introduced, he behaved with much circumspection, conversing only upon common topics. When he visited Dr. Sykes, his usual way was to sit with him upon a couch, and, reclining upon his bosom, to discourse with him, in the most familiar manner, upon such subjects as were agreeable to the taste and judgment of both. When sir John Germaine lay upon his death-bed, and was in great confusion and trouble of mind, he sent for Dr. Clarke, and requested to know of him whether he should receive the Sacrament, and what he should do in his sad condition. The doctor, who was well acquainted with sir John’s pursuits and course of life, sedately replied, that he could not advise him to receive the Sacrament, and that he did not think it likely to be of any avail to him with respect to his final welfare. Having said this, he departed, without administering the communion, having first recommended the dying man to the mercy of God. Mr. Pope has a kind of reflection upon Dr. Clarke’s frequenting the court; to which the poet was stimulated by resentment against the doctor, because he refused to use his interest for obtaining the recall of lord Bolingbroke from France, with a general pardon. Dr. Clarke’s character is so much involved in controversy, that we found it impossible to enter more fully into it. Much information, however, may be derived from the Biog. Britannica, a professed defence of his principles and conduct; and from the lives of him written by Whiston and Hoadly.—Whitaker’s Origin of Arianism.—Warburton’s Letters.—Nichols’s Bowyer;—and above all, the pamphlets noticed above. His ms notes for reforming the Liturgy are in the British Museum.—See also Tytler’s Memoirs of Lord Kames, vol. I, p. 26.